In 1909 the Japanese chemist Kikunae Ikeda defined Umami: the fifth taste sense, the savoury, that little touch of sensory magic which enables us to enjoy food rather than simply experiencing it. It also paved the way for Monosodium Glutamate and all those other “flavour enhancers” with which the food industry not only convince us to eat more processed food than is perhaps ideal, but deceive us into believing we are enjoying ourselves while we do so. The majority of Ambiente Frankfurt exhibitors hawk a form of Aesthetic Monosodium Glutamate: synthetic imitation presented as nutritional design and handicraft and with which they deceive, aiming as they are to convince us that their wares will somehow enhance our lives, will make our daily existence more enjoyable. They won’t. They really, really won’t. Fortunately our taste buds were rescued from the unremitting synthetic attack by the few purveyors of natural Umami present, such as Japanese design studio Bouillon. Established in 2016 by Nagoya University of Arts graduates Hiroki Nasu & Shunya Hattori, Bouillon’s, still very young, portfolio is defined by their contemporary applications of traditional craft and intelligent use of natural materials, and although we admittedly haven’t seen all the objects in persona there is a lot in their broth which appeals to us. Ambiente 2017 was our first contact with Bouillon, although it appears we missed them at SaloneSatellite Milan 2016, which is most irritating, but having now discovered them we’re very much looking forward to seeing where the journey take us. For now it took us to these two genuinely delicious morsels…..
Back in the day the police officers who guarded the British Prime Minister’s official residence at 10 Downing Street enjoyed the luxury of specially designed chairs: in a compartment under the seat hot coals could be placed, thus ensuring a snug wait for Georgian ne’er-do-wells. A similarly delightful piece of design thinking underlies Warm Stool. 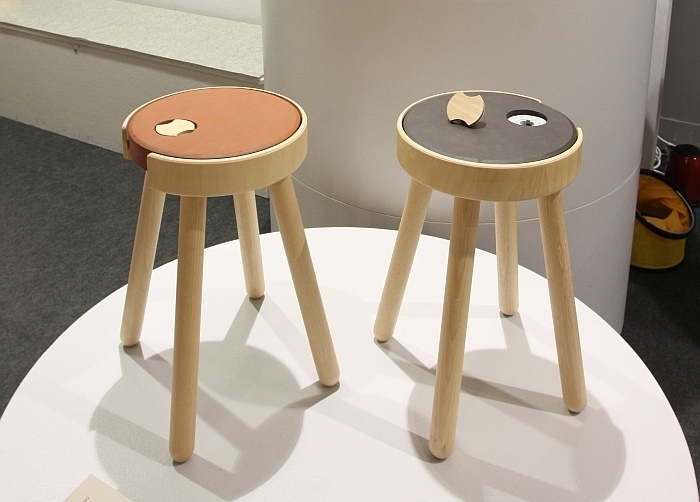 Reminiscent of a traditional milking stool, albeit with four legs, Warm Stool is a beautifully formed and proportioned object in its own right, the real attraction of the stool however is the ceramic seat: the hollow ceramic seat which when filled with freshly boiled water functions like a hot water bottle and gently warms from below. The question is, is that necessary? Is that good? We for example don’t like heated car seats. Really, really, really don’t. Others adore heated car seats. Worship them almost. Car seats are however a classic example of seating with a very specific location and function, Warm Stool as general purpose seating should find a greater degree of acceptability. Us for example. Who are very taken with both object and experience. Quite aside from the obvious attraction of being able to sit outside on a sunny, if very chilly, spring and/or autumn day, we can also well imagine it being particularly welcome in a cold atelier/office of a morning, on cold winter days for those who take up a bit of time to warm up, or by those who enjoy the simple comfort of gentle warming from below. There must also be an argument somewhere for the use of such by the elderly, or others with joint/muscle problems. Beyond the simple functionality we really like the self-confident analogousness of the system. One could, no doubt, develop an app to control an electronic heating system. But honestly, why would you want to when the almost primal sensation of water warmed ceramic is available. While admittedly probably not a solution for all, as a concept Warm Stool is not only very interesting, but excellently conceived and realised. 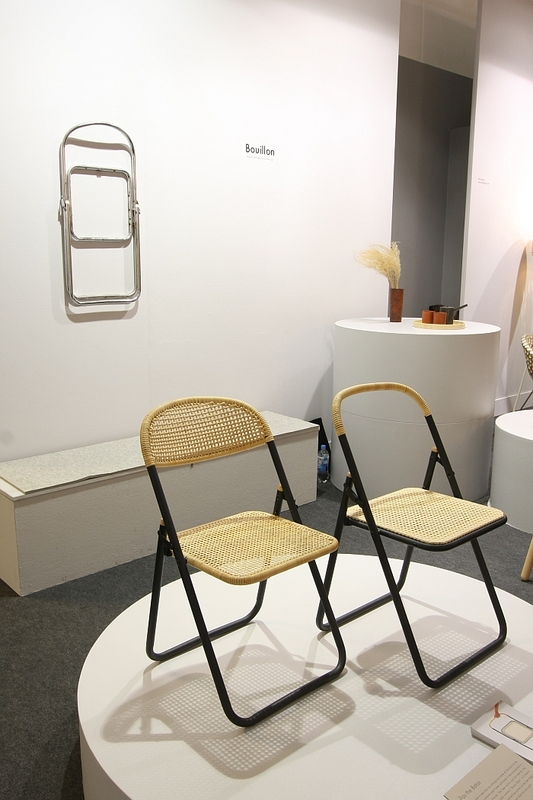 Produced in numerous versions all Baton Chairs start life as a discarded folding chair frame, to which Bouillon add a woven rattan seat and backrest. The black coating applied to the frame both contrasting nicely with the rattan and generally adding to the object’s aura of reserved elegance. Although we can well imagine other frame finishes working just as well. There are a couple of aspects about Baton Chair which particularly appeal to us. The first is the high-quality nature of the transformation: here is an object created with attention to detail, with a very clear understanding of why, and which is planning to fulfil its function for a long, long time to come. History here isn’t the traditional craft involved, but the chair’s intended destination. Then there is the fact that the folding chair is such a simple, anonymous, inconsequential object. When it gets old you bin it. When an old sofa or armchair starts to show sign of age, one reupholsters it. A piece of furniture must by necessity fulfil numerous functions, just because it can’t fulfil one is no need to discard it. If a folding frame functions, the chair functions, everything else is just a question of aesthetics. Bouillon’s solution not only works but makes a strong statement against throwaway culture. It is probably not the most original idea, although we are struggling to find parallels, and has a little bit of that sweet bouquet of a student project about it: is however a truly charming piece of work in whose company it is a genuine pleasure to find oneself.